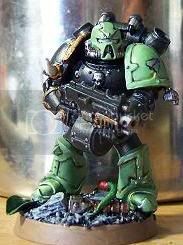 Moved on to your fourth (Chaos) Space Marine army, in need of some variation in the design of the holy bolter or just interested in given those Chosen or Veterans some unique weaponry? Then perhaps the barrel-loaded bolter may offer you some new inspiration. 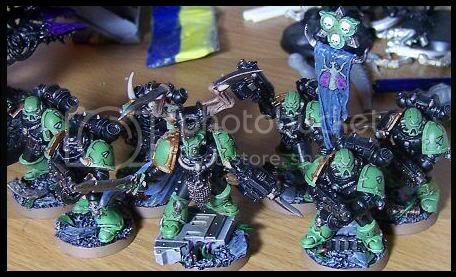 After several people asked me how I made the bolters for my Purge Chaos Space Marines I decided to make this conversion guide. Though this weapon looks great on Nurglesque models it should also work for others. I can imagine veterans marines of the Imperial Fists would look great with these as well. So about time I added this article I wrote for Astromag issue 2 to my blog's tutorial section! - A spare Ork barrel-loaded shoota. - Glue and a cutting tool. 1. Get a bolter and an Ork barrel-loaded shoota. 2. Clean any mold line of the bolter and remove the triggerarea. In addition you may want to drill out the gun barrel at this stage. 3. Remove the ammo clip or belt, you can use the horizontal line just behind the weapon’s grip as a guideline. 4. Time to move on to the shoota, remove the trigger to make further cutting easier. 5. Cut of the entire barrel, including the millimeter or so above the barrel. 6. Cut of a small section of the barrel’s support as shown in the picture above. 7. Cut of the supporting circle on the back of the barrel. 8. Cut of a very small segment of the square on the top of the barrel. We’re talking 0.5 to 1 mm, this will allow the barrel to line up with the thinner bolter. 9. Frontal view of the cut up barrel. 10. Next glue the barrel to the adjusted boltgun. 11. Cut out 2 small plasticard segments and glue them into place as shown above. Once painted they add to the bulkier look of the gun. 12. Slab on some paint and you’ll quickly end up with some very unique and easily converted minis! 13. 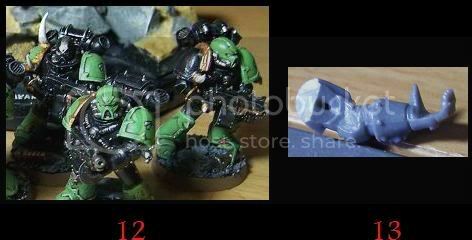 Keep in mind though that the slightly bigger bolter may require you to make some small corrections on the bolter-supporting arm. Luckily a small adjustment and blob of greenstuff will take care of this in seconds. And there you have it, an easy conversion for maximal effect. I accidently stumbled across this one, as I do with most of my ideas. I’ve had great fun using this on my first Purge squad, so much in fact that this one-shot squad will get some more comrades somewhere in the near future! But the fun doesn’t have to end here, this ammo/weapon-swap idea can be applied to a wide range of other conversions. Here are some additional ideas to gets those creative juices flowing, so dive into that bitsbox and get converting. Your options are afterall only limited by your own creativity! 1. 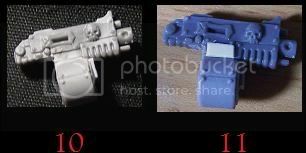 Combine a bolter with the ammo clip from an Ork slugga. The slugga’s clip is better suited than the shoota due to its smaller size. One could even take this so far that the very weapon becomes the defining feature of the mini, aiming it with huge, outlandish weaponry. 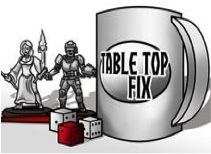 I applied this idea to my old Ork Flash Gitz. This was many, many years before the current plastic kit came out. But liking the Dakka I needed some extra shooty-looking lads, but I also wanted some way to represent their More Dakka and Shootier upgrades. This led to the following wacky conversions on a unit which served my Warlord very well indeed! And that concludes this mini-conversion guide, I hope this has given some of you guys and gals out there a couple of ideas. So have fun converting and keep an eye out for more of these conversion articles in the near future! Oh those barrel-loaded bolters are fantastic!!! Glad I could provide some ideas, about time I put my Astro Magazin article on my blog right!